Harry Potter, along with his best friends, Ron and Hermione, is about to start his third year at Hogwarts School of Witchcraft and Wizardry. Harry can't wait to get back to school after the summer holidays. (Who wouldn't if they lived with the horrible Dursleys?) But when Harry gets to Hogwarts, the atmosphere is tense. there's an escaped mass murderer on the loose, and the sinister prison guards of Azkaban have been called in to guard the school . 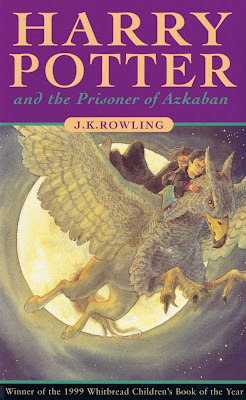 . .
A fantastic new story featuring Harry and his friends from the spellbinding J.K. Rowling. I've given up on trying to write coherent reviews for any of the books in this series - it just isn't possible for me to stop fangirling long enough to put my thoughts into any sensible order! Harry Potter and the Prisoner of Azkaban has always been my favourite book in the series and that hasn't changed. The series starts to get darker in this one and knowing all the things that are going to happen in the later books just makes you appreciate the characters even more on a re-read. I love pretty much everything about this book. Of course you have the fantastic friendship between Harry, Ron and Hermione but there were moments I was annoyed with the way the boys treated her. To be honest I think their reactions were pretty spot on for their age though so that doesn't bother me too much. Seeing Hagrid as a teacher is great and the interaction between Buckbeak and Malfoy at his first lesson was hilarious. I loved Sirius and Lupin from the beginning and the antics between Crookshanks and Scabbers never fails to make me laugh. I'm still determined that one day I will have a huge ginger tom cat and I WILL call him Crookshanks LOL. The Weasleys never fail to lighten up the story and although I particularly love Fred and George it was great to see a bit more of Giny in this one. The idea of the Marauders Map is utterly brilliant and I still think "I solemnly swear I'm up to no good" is perfect for a tattoo. Between the map and the Time-Turner J.K. Rowling is always adding wonderful creations to the world she has built so you really never can tell what she's going to throw at you next. I may be incredibly behind on the massive group read but I'm looking forward to continuing with the series.